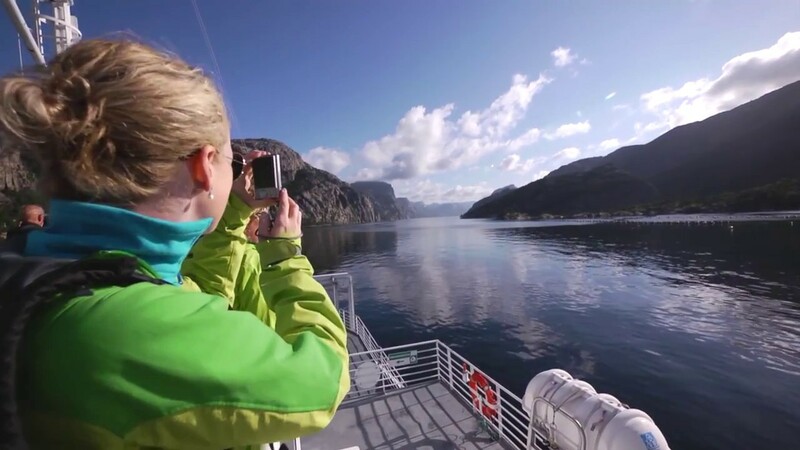 A comprehensive trip where you get to experience the top attractions in Fjord Norway. See the beautiful fjords, drive several Norwegian Norwegian Scenic Routes, explore mountain and fjord villages and interesting towns and cities, see attractions on the UNESCO World Heritage List, go on glacier walks – and much more. From Kristiansand, drive first to Sogndalstrand, a well-preserved village with wooden houses built in the 1700s and 1800s, and one of the most popular destinations in the region. Then drive through Byrkjedalen and Hunndalen valleys and on to Lysebotn. Stop at Ørneredet (eagle’s nest), a fantastic viewpoint overlooking the Lysefjord, before continuing down the 27 hairpin bends. Take the ferry to Forsand or Lauvvik. Enjoy the view of Mount Kjerag on the south side, and then up to the Pulpit Rock 600 metres above the fjord on the north side. In Stavanger, visit the Norwegian Canning Museum, the Norwegian Petroleum Museum and Old Stavanger, and stroll across the market square and along the harbour. Stavanger is also famous for its gastronomy and street art. Spend the next day on the beautiful Scenic Route Ryfylke. Don’t miss the salmon studio in Sand and the old zinc mines, industrial buildings and museum at Allmannajuvet. Stop and admire the Svandalsfossen waterfall, and consider a detour to Røldal stave church. The road passes the famous Låtefossen waterfall and then continues onwards to Odda. Once there, you are not far from the starting point for the challenging walk to the Trolltunga rock. The quickest way to Bergen takes you under the glacier through the Folgefonna tunnel. Another tunnel, the Jondal tunnel, twill lead you to the Hardangerfjord. Stop at the Steinsdalsfossen waterfall, just outside Norheimsund, where there is a path that takes you behind the waterfall. 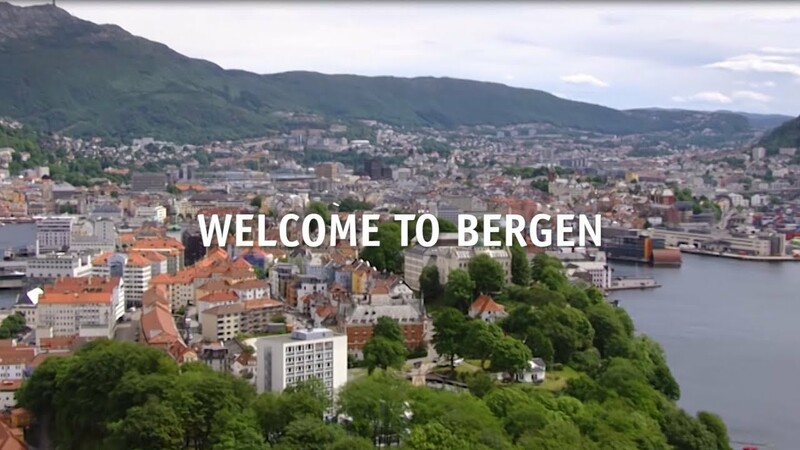 Bergen is full of experiences, and the highlights include Bryggen, the Fløibanen funicular, the Ulriksbanen cable car, the Fish Market and the KODE museums. Leave Bergen and head towards Voss. At Voss, you can take part in active experiences such as rafting, a wind tunnel and a climbing park. From Voss, continue onwards to Gudvangen. Stop at the Tvindefossen waterfall, not far from Voss. Take the old road to Stalheim – and you will be rewarded with spectacular views from Stalheim Hotel, before you continue down the 13 hairpin bends of the Stalheimskleiva road, and on to Gudvangen. In Gudvangen (or from Flåm), join a fjord cruise on the world’s narrowest fjord, the Nærøyfjord (a UNESCO World Heritage attraction). Then take the two tunnels to Flåm. In Flåm, you can catch a ride on the famous Flåm Railway, and then stop by Ægir, an award-winning brewery pub whose architecture is inspired by stave churches. Drive along the fjord to Aurland. You can choose to drive through the Lærdal Tunnel, the world’s longest road tunnel – but in the summer, we recommend the Scenic Route Aurlandsfjellet. Stop at the Stegastein viewpoint. Be sure to see the scenic Lærdalsøyri, one of Norway’s best preserved villages. In Kaupanger, stretch your legs at Sogn Folk Museum, and visit Kaupanger stave church. We recommend a detour to Urnes stave church – the world’s oldest stave church, inscribed on the UNESCO World Heritage List. You can get there by taking the ferry from Solvorn. Drive onwards to the Breheimsenteret Glacier Centre in Jostedalen, and join a guided glacier walk on Nigardsbreen glacier, an arm of Jostedalsbreen, the biggest glacier in continental Europe! Take the Scenic Route Sognefjellet in the direction of Geiranger. Follow the Lustrafjord. You are now in Jotunheimen National Park, where you can see several of Norway’s tallest peaks in the distance. The Scenic Route Geiranger – Trollstigen starts at the end of Langvatnet lake. There is a private toll road up to what may be the most impressive panoramic view in Norway, from Dalsnibba (1,476 m). Also stop at Flydalsjuvet, a very popular photo stop high above Geiranger. In Geiranger, go on a fjord cruise or hire a kayak, see the Seven Sisters waterfall, and walk up to the farm Skageflå. Stop at the Ørnesvingen viewpoint platform, which gives you beautiful panoramic views of Geiranger and the fjord. Valldal is said to have the best strawberries in Norway. Also make a stop at Gudbrandsjuvet gorge, where the Valldøla river has formed a system of potholes and striking rock formations. 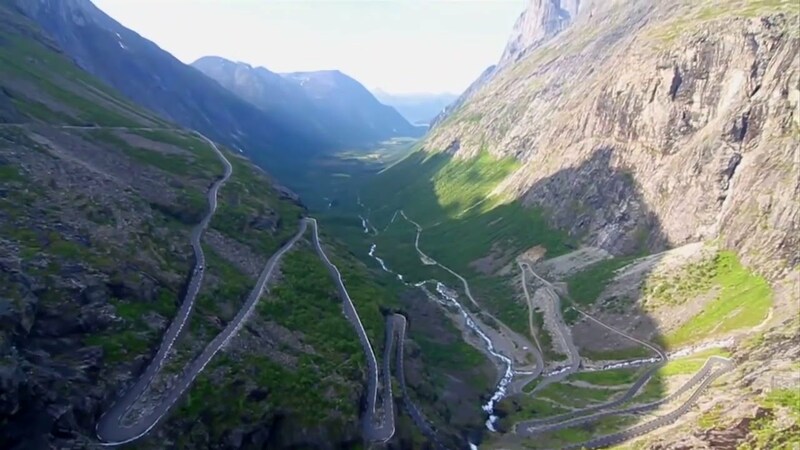 Soon you will arrive at another national treasure: the Trollstigen road. Stop at the top, enjoy the view and admire the feat of engineering. The drive down (or up) the 11 hairpin bends is like ‘rock climbing by car’ – so make sure that your brakes are working! A stone bridge takes you across the 320-metre-high Stigfossen waterfall. Åndalsnes is the starting point for the walk across the Romsdalseggen ridge, and a paradise for wildlife experiences. A stop here is a good idea if you feel like a walk in the mountains – or you can continue directly to Ålesund. Head for the Fjellstua viewpoint on Mount Aksla to enjoy the views of the Atlanterhavsparken aquarium and the Art Nouveau Centre. You can also go on a RIB trip to the bird island of Runde and go kayaking in Brosundet sound. 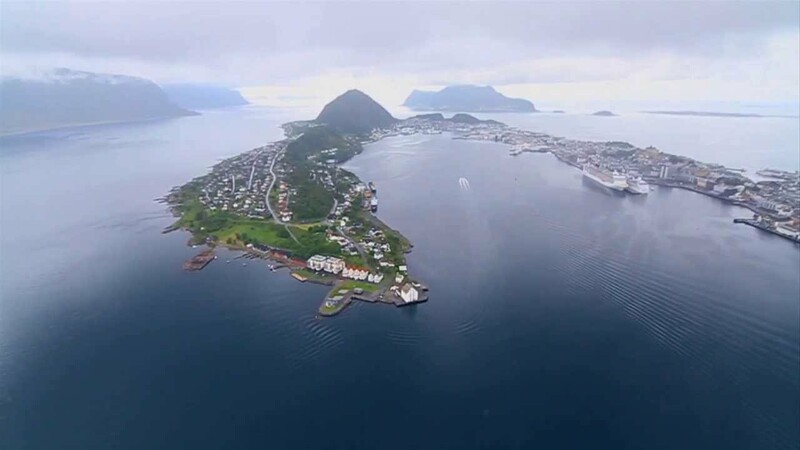 Molde is the town of jazz and roses. From the viewpoint Varden, you can see the fjord and the Molde panorama with its impressive 222 peaks. Just under an hour from Molde is the fishing village of Bud, the biggest trade centre between Bergen and Trondheim in the 1500s and 1600s. Today, it is best known for its seafood restaurants and cultural history. The Scenic Route the Atlantic Road starts here. At times, it almost feels as if you are driving on the sea itself! Stop at one of the many roadside picnic areas. It is also possible to stop here to try your luck at fishing. Kristiansund is the last leg of the journey. The town is scattered over four islands right at the ocean’s edge, connected by bridges. It became famous for its clipfish production, which you can learn more about at the Norwegian Clipfish Museum. Don’t miss the island of Grip – now only inhabited during the summer. The charming houses and the 500-year-old stave church are huddled together like a small village. If you are going back to Kristiansand, it is quickest to travel via Oslo. Consider stopping in Trondheim if you have the time.